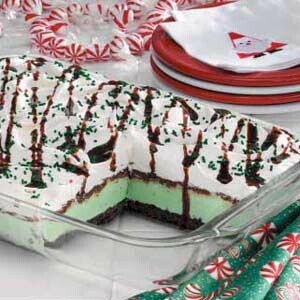 Mint ice cream and colorful sprinkles make this cool concoction perfect for holiday parties or meals. For a chocolaty dessert, use rocky road or chocolate ice cream instead. In a large saucepan, combine chocolate chips, confectioners' sugar, milk and remaining butter. Bring to a boil, stirring frequently. Cook and stir for 3-5 minutes or until thickened. Cool to room temperature. When cool, spread over ice cream; return to freezer until firm. Remove from the freezer 15-20 minutes before serving. If desired, drizzle with chocolate syrup and top with sprinkles. Yield: 24 servings. 1 serving (1 piece) equals 391 calories, 23 g fat (14 g saturated fat), 37 mg cholesterol, 223 mg sodium, 41 g carbohydrate, 1 g fiber, 4 g protein.